I only wish it was possible to hand deliver them. Then stay for tea and have a little chat. what a lovely bouquet of flowers! how beautiful! are they from your garden? oh and btw, your grandma is going to flip out and cherish that book so much! what a sweet, sweet, thoughtful project. 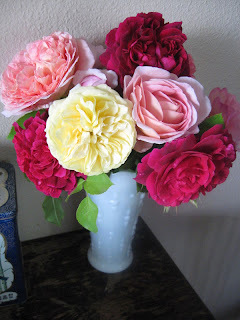 yes Jes, the bouquet was picked from my garden, which makes them that much more treasured. gorgeous!!! I can almost smell them! !